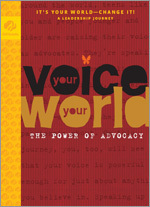 Your Voice, Your World: The Power of Advocacy. How often have you seen something that really needed to be changed and wondered, "Why isn't someone doing something about that?" This journey, for eleventh-and twelfth graders gives Girl Scout Ambassadors a way to be that someone - an advocate with the power to start the first flutter of real and lasting change. While creating their own "butterfly effect", they'll learn skills-such as networking, planning, and speaking up for what they believe-that will prepare them for life beyond high school. This journey book is 104 pages long. How often have you seen something that really needed to be changed and wondered, "Why isn’t someone doing something about that?" This journey gives Girl Scout Ambassadors a way to be that someone—an advocate with the power to start the first flutter of real and lasting change. While creating their own "butterfly effect," they'll gain an array of skills—such as networking, planning and learning to speak up for what they believe—that will benefit them as they prepare for life beyond high school. This journey offers Ambassadors the tools to dig for the root of an issue they deeply care about and then to explore possible solutions. As they advocate for a solution, girls at the highest level of Girl Scouts will develop confidence and valuable leadership skills—problem-solving, research, networking, persuasive speaking and consensus-building. These skills are a strong foundation for girls to be leaders who speak up for what they believe in life now—and into the future! The Girl Scout Advocate Award is earned by Girl Scout Ambassadors who choose to complete the eight Steps to Advocacy as they explore an issue that they find intriguing and exciting, engage community partners and advocate for change. Whether or not their advocacy effort succeeds, girls will have taken steps to make the world a better place!